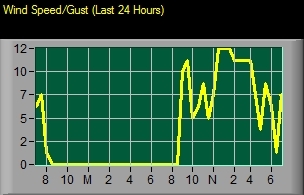 This page contains captured data values and trend graphs for Wind Speed and Direction. Wind speed is measured in Miles per Hour and "force" as defined in the Beaufort Scale. Click here for information on the Beaufort Scale. Current local conditions taken on 21/4/19 at 7:01pm. 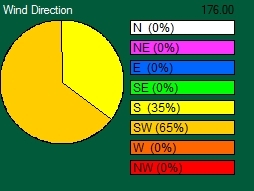 Details of annual statistics for Wind Speed and Direction, can be found on the Statistics page.